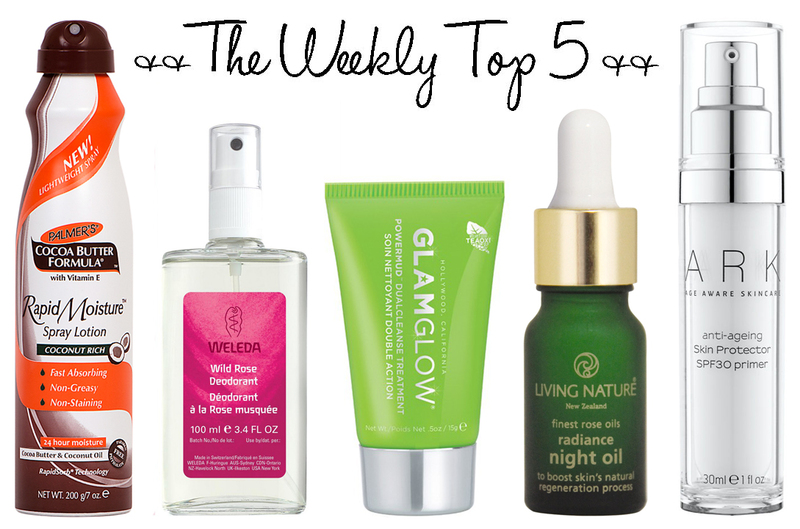 It’s week 4 already of my weekly favourites, and this week I’ve ben loving a whole range of skincare and body products. Also it was our 10 year anniversary on Tuesday – that’s 10 years since I met the other half, and we’ve only been married 2 years this September. As you get shorter sentences for murder these days we thought this was definitely something worth celebrating, so he took me away for a surprise evening on Friday night. We went to a gorgeous hotel, had some proper fancy food and stayed in a lovely room – with a whirlpool bath! It was amazing! Oh and the bath had lights in it too, so the bubbles glowed different colours! I mean what more could a girl possibly need? Unfortunately our room was above a rowdy bar, so we didn’t have a chance of sleeping until everyone left which was quite a shame as it was a fantastic stay otherwise. Anyway, let’s get on to this week’s favourites! Living Nature Radiance Night Oil (£48.00) I’m a big fan of facial oils, I love how they make your skin super soft and supple and they just feel like they’re doing something good to your skin. I’ve just started trying out Living Nature’s Radiance Night Oil and it’s definitely a winner in my books. This oil aims to boost your skin’s overnight rejuvenation and renewal process, utilising the finest Rose Oil to stimulate your skin’s own collagen production, Rosehip Oil to aid cell regeneration and repair, Calendula to soothe and calm, Carrot Oil to revitalise and tone, Jojoba Oil to nourish, and Frankincense Oil to repair dry skin and heal blemishes. For the last week or so I’ve been using this before bed and I’ve been waking up with super soft skin every morning! Glamglow Powermud Face Mask (£14.99 for 15g) I actually had a Powermud sample a long time ago but gave it to a friend who was desperate to try it – and she loved it! Now I have another one, I can definitely see what all the fuss is about. The Powermud face mask has a mud-to-oil formula to deeply and gently cleanse skin. It removes dead cells, dirt, impurities and make-up build up from pores – which is exactly what I need right now. It’s made with Claytox™, a four-clay blend technology to detoxify and purify the skin, OILIXER™which contains pine oil and frankincense oil to nourish skin, and PUREIFIER™ which conditions with its moisturising ingredients. My 15g sample tube will last for a handful of uses depending how sparingly you apply the product, I’ve only used this once so far and was thrilled with the result. My skin was left feeling super clean, fresh and thoroughly cleansed. Palmer’s Rapid Moisture Spray Coconut Rich (£4.99) I love nothing more than trying out new bath and body products, so my bathroom always looks a bit like I’ve raided Boots. My latest discovery is Palmer’s new Rapid Moisture Spray – this is a lightweight, non-greasy and fast-absorbing spray made with pure Cocoa Butter, Coconut Rich Oil and Vitamin E to leave you with smooth and supple skin that lasts up to 24 hours. A little goes a long way with this product, it smells like gorgeous and I love that it absorbs quickly into the skin so you can get dressed straight away. ARK Anti-Ageing Skin Protector Primer (£36.00) Primers are gradually becoming one of my makeup obsessions (they’ll never beat lipsticks though!) and I’ve been trying out ARK’s Skin Protecting Primer this week. This is a base with added benefits; described as your skin-perfecting daily defence, it includes broad spectrum defence against UVA and UVB rays to prevent sun damage and premature ageing, and ARK’s Advanced Active Antioxidant system with Vitamin E, Shea Butter, and extracts of Jojoba for daily defence against ageing. This primer is nothing like others I’ve previously tried, firstly it looks more like a white moisturiser, but with a thinner texture, and it doesn’t have the silicone feel that many primers have. I’m really impressed with the result though, it feels super light on the skin, and definitely helped my makeup stay put all day.